While we mere mortals, busy with their daily affairs - who was standing in a traffic jam, someone is reading blogs, while others simply enjoy the spring outing - spacecraft "Cassini" the size of a school bus continues to collect data and images from Saturn distance of 1.4 billion kilometers away. 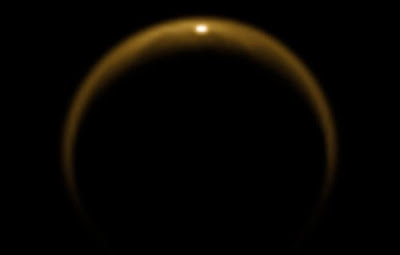 In the past few months Cassini repeatedly circled the moon of Saturn, captured the sun's reflection in a lake on Titan and made fantastic photographs of kriovulkanizma on Enceladus. In this issue, the photos taken at the Saturn system. Apparatus Cassini took this image of the planet in its natural color in just a month after the equinox of Saturn in August 2009. The shadow cast by the rings on the planet, remains narrow. 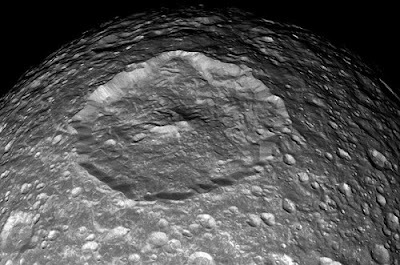 The point at the bottom left - a satellite Mimas. The picture was taken with the camera shirokoobektivnoy "Cassini" 4 September 2009 at a distance of approximately 2.7 million kilometers from Saturn. Flying along the orbit of Saturn, Cassini has made the picture of Saturn's moon Tethys with vidneyuschimsya crater Odysseus. Tethys is behind the largest satellite of Saturn - Titan. This satellite (1062 km in diameter) is twice as far from the "Cassini" than Titan (5150 km in diameter). Tethys is located 2.2 million kilometers away from Cassini and Titan - just 1 km. This photograph was taken with the camera with a small angle of 26 November 2009. Zoom 6 kilometers per pixel on Titan and 13 kilometers per pixel on Tethys. Small satellite of Saturn Mimas - just 394 kilometers in diameter - is seen against the background of the upper layer of the atmosphere of Saturn on Nov. 26, 2008. Distance from Mimas to Cassini was about 915,000 km. February 13, 2010 Cassini approached to a distance of Mimas and 70 000 km. In the background you can distinguish the edge of Saturn and the upper layer of the atmosphere. In this picture, taken during the closest flight Cassini from Saturn's moon Mimas visible crater Herschel width of 130 km. Cassini approached the satellite at a distance of 9500 km February 13, 2010. In February 2010, "Cassini" met with the tiny satellite of Saturn Calypso. Endowed with unusual shape, Calypso (30 x 23 x 14 km) - one of two Trojan moon, who travel on the same orbit of large satellite Tethys, moving back and forth. On a smooth surface Calypso virtually no craters, as on most satellites of Saturn. The photograph was taken February 13, 2010 at a distance of 21,000 km. 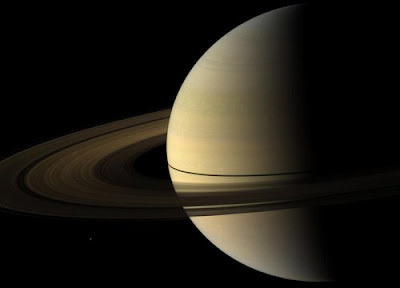 Saturn's satellite Enceladus has a diameter of 500 km is from Cassini at a distance of approximately 200 000 km. 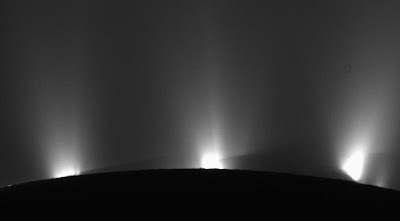 These reflections on Enceladus were imprinted "Cassini" 18 May 2010 at a distance of about 17 000 km. 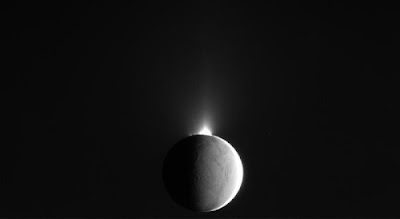 Cassini was on the dark side of the satellite and witnessed how the ice is reflected from the crack south pole of Enceladus. Zoom - 100 meters per pixel. 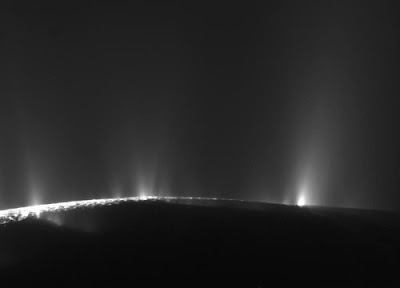 Another shot of ice pillars of Enceladus, made Nov. 21, 2009. New kriovulkanicheskaya active satellite was opened in 2005 and to this day remains the subject of careful study. Originally created from water vapor, these pillars also contain nitrogen, methane, carbon dioxide, propane, ethane and acetylene. Cassini approached the moon Enceladus November 21, 2009 at a distance of 2,028 km. In the picture you can see the cracks and ridges on the ice surface. 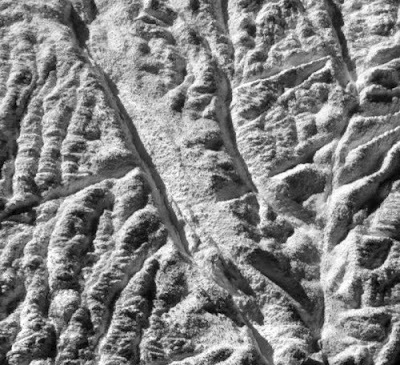 The approximate shape of the surface of Enceladus, known as the Baghdad Sulkus - one of the four "tiger stripes" that cross the south pole of Enceladus. Cassini photographed the area in search of plumes. Zoom to 30 meters per pixel. 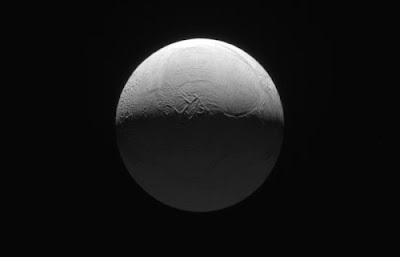 Even more detailed snapshot of Baghdad Sulkusa on Enceladus. 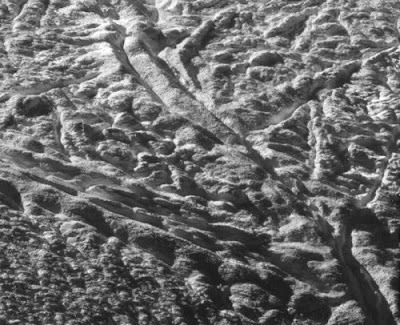 When the scale of 12 meters per pixel becomes visible characteristics such as surface ice boulders. Estimated distance from edge to edge image - 12 km. 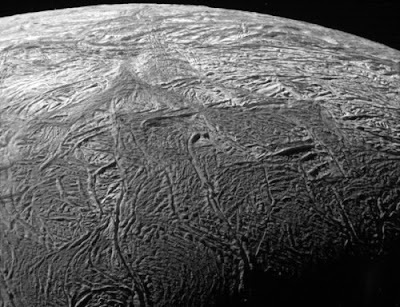 Enceladus continues to throw up the ice into space. Photo taken October 14, 2009. Medium Saturn Elena. It was opened in 1980. Width - 35 km. May 18, 2010 Cassini turned his camera to the largest satellite of Saturn - Titan, filmed at the same time the edge of Enceladus (dark area at the bottom) and the rings of Saturn between the moons. October 14, 2009 - Saturn brightly lit Tefiyu. Tethys - one of the four satellites of Saturn, discovered by astronomer Giovanni Domenico Cassini in 1684. This icy body, a little more than 1000 km in diameter. 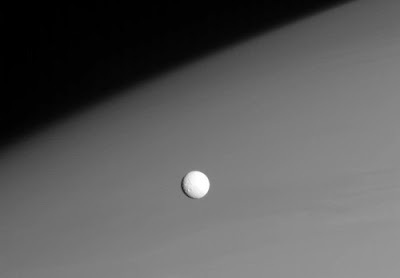 Craters sprinkled the surface of Saturn's moon Prometheus, like eyes on potatoes. This photograph was taken apparatus "Cassini" January 27, 2010. 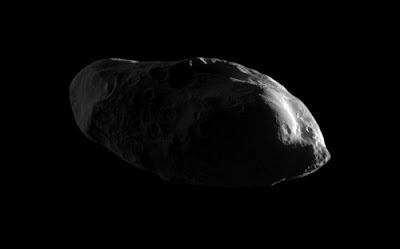 Snapshot looks toward the traveling hemisphere Prometheus (86 kilometers in diameter). Photo was taken at a distance of approximately 34 000 km from Prometheus. Zoom - 200 meters per pixel. Saturn's satellite Rhea hovering near his "twin" Epimetheus spans. In the background - the rings of Saturn. In fact, two satellites are far away from each other. The picture was taken at a distance of approximately 1.2 million km from Rhea, and 1.6 million km from Epimetheus spans. The photograph was taken March 24, 2010. 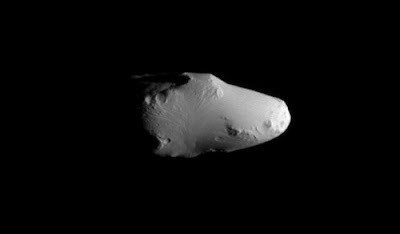 Scale - 7 km / pixel at Reeh and 10 km per pixel - on Epimetheus. 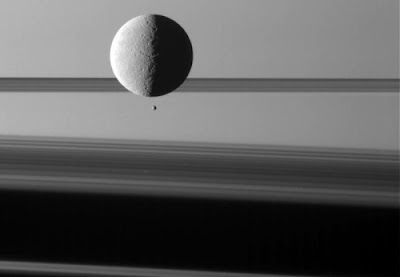 December 25, 2009 Cassini was on the dark side of Saturn and took a photo of the moon Enceladus Saturn and its rings. Light passing through the atmosphere of Saturn, creating a bright arc (top down). Bottom center of the light passing by, blocked rings. Cassini photographed the clouds in the upper layer of the atmosphere of Saturn. Right - the edge of the satellite Helena. Photo taken March 3, 2010. 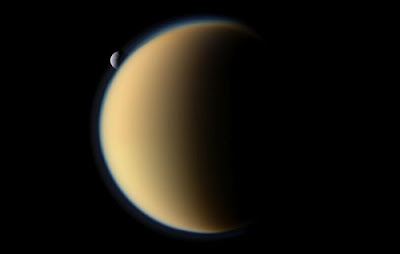 This picture shows the first outbreak of the sun, is reflected in the lake on Saturn's moon - Titan. The photograph was taken July 8, 2009. This is a mirror image, which confirmed the presence of fluid in the northern hemisphere of the satellite, where the lakes are much bigger and they are much larger than in the southern hemisphere. Scientists Cassini have been able to agree on the reflection of the southern shoreline of Lake of the Titan, which is called the Kraken Mare. The area of the lake about 400,000 sq.km. 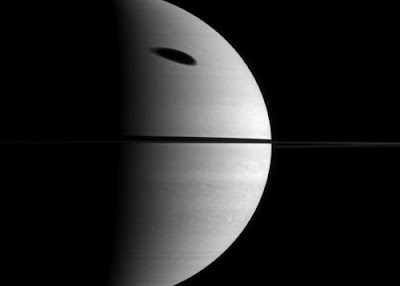 Saturn's rings, partly darkened shadow cast on them, the planet itself, stand in front of the largest satellite of the planet - Titan. The dark side of the planet is to the left, outside the image. Titan, backlit you can see above, below and through the holes in the rings. 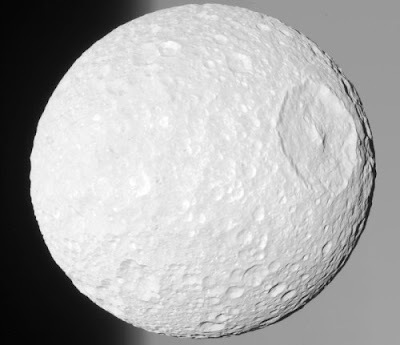 Satellite Mimas (396 km in diameter) near, the bottom image. 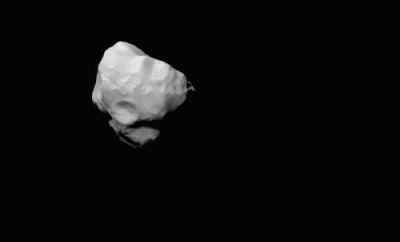 Atlas (30 km in diameter) can see near the ring F, slightly to the right over the center of the image. 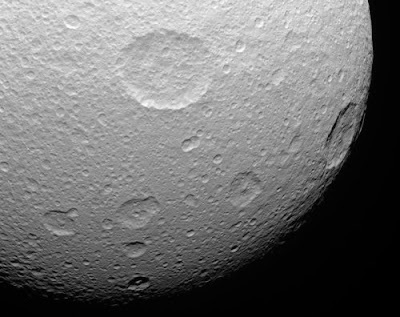 Photos surface of Saturn's moon Dione was taken by the apparatus Cassini April 7, 2010. 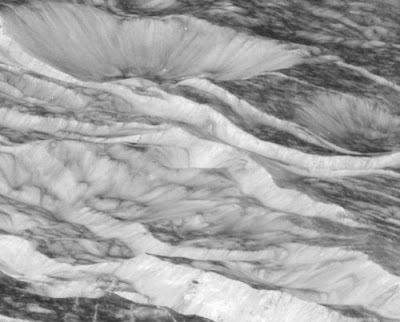 The picture was taken at a distance of 2500 km of Dione. Zoom - 15 meters per pixel. 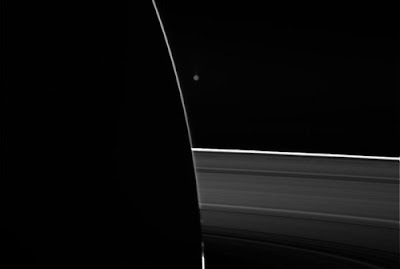 Enceladus partially blocking the "Cassini" view of the brightly lit part of Saturn's rings May 18, 2010. 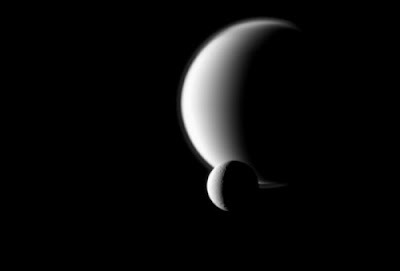 Saturn's satellite Dione passes by a larger satellite - the Titan. The picture was taken with a camera with a small angle on the unit "Cassini" March 12, 2010 at a distance of about 2.2 million km from Dione and 3.6 million kilometers from Titan. 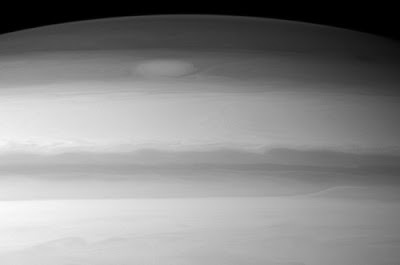 The large cloud visible in the high northern latitudes of Saturn on Feb. 14, 2010. 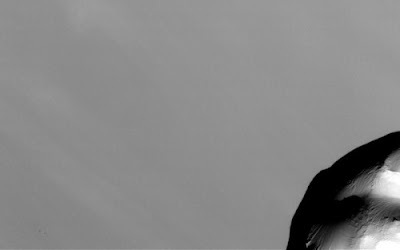 The picture was taken at a distance of 523,000 km from Saturn. Zoom - 28 km per pixel. 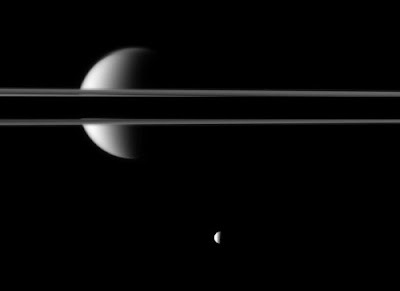 Satellite Prometheus creates sophisticated designs excitement in the ring F, while the satellite Daphnis worried ring A. The photograph was taken during the equinox in August 2009. 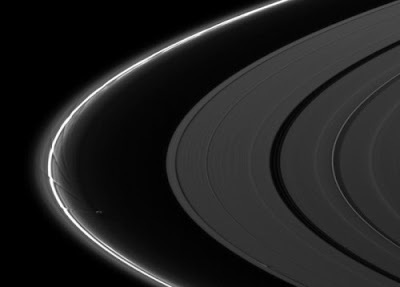 Prometheus (86 kilometers in diameter) can be seen between the thin F ring and the ring A in the center of the image. Gravity kartofelevidnogo Prometheus periodically creates waves on the ring F. Below you can see photos of Daphnis (8 kilometers in diameter), which creates waves in the Keeler Gap in the ring A. The satellite has an inclined orbit, and its gravity disturbing the orbit of the particles of ring A, forming the edge of Keeler Gap and its cutout in the waves with horizontal ( radial) and vneploskostnymi components. The picture was taken August 22, 2009. Zoom - 12 km / pixel. 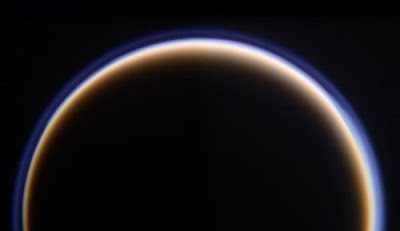 Golden "smoky" atmosphere of Titan and the fog with a complex pattern of layers similar to the picture on the glowing halo around the satellite. These pictures were taken with red, blue and green spectral filters were combined to create this color picture. For this mosaic were connected by six shots - two to three colors. 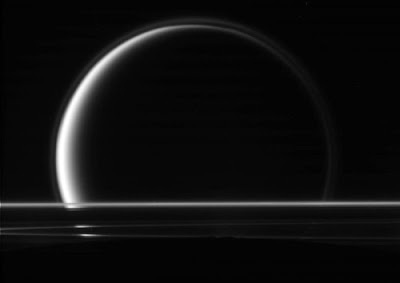 All the pictures were taken by the apparatus Cassini on Oct. 12, 2009 at a distance of 145,000 kilometers from Titan. This is one of the nicest images I have seen come back from space... its very scary knowing what is out there and reassuring knowing whatever it is ,is so pretty !